Have you seen that? This fantastic red ball is waiting for you! Just try to solve each puzzle as better as possible and you will be not disappointed. Is everything clear? Then go ahead right now and start the game. Everything is up to you. This is your chance to go on an adventure with Red Ball. Could you believe that? So, just try to collect stars and solve puzzles to unlock gates to new areas. 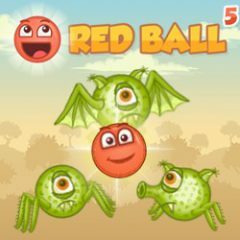 Well this amazing online game Red ball is simple but a very fun adventure game with tons of small puzzles to solve and beautiful 2D graphics. That is why you are the only one, who can cope with it. So, just throw all the problems away and play the most exciting game you have ever seen. Do not forget to collect all the stars and enjoy playing it.